Analog Man carries the Boss RC-2 Loop Station. Authentic Loop Station in a Stomp Box. No company creates Loop Stations like BOSS. Housed in a compact-pedal case, the RC-2 puts a surprising amount of features in a stompbox. No company creates Loop Stations like BOSS. Already in heavy demand around the world are the twinsize BOSS RC-20XL and the deluxe, extra-wide RC-50. Now comes an ultra-compact member of the RC family, the RC-2. Housed in a compact-pedal case, the RC-2 puts a surprising amount of features in a stompbox. The RC-2 can record and store up to 16 mono minutes of audio, either from your own instrument or other external input devices, such as MP3 players / recorders. Each of your layered loop creations can be stored to one of 11 internal patch preset locations. It records, layers, and loops, but the RC-2 also provides a wealth of other handy and powerful features, such as a jam-along Rhythm Guide, Auto Start, Tap Tempo, Loop Quantize, and Undo / Redo. In traditional BOSS fashion, the RC-2 benefits from a clean and friendly user interface. As powerful as this little Loop Station is, it’s a dream to operate. Thanks to its clearly labeled buttons and knobs, the RC-2 puts everything directly under your fingertips, with no hidden menus or commands to impede the creative process. Thousands of guitarists rely on BOSS’ ultra convenient BCB-series pedalboards for organizing their effects pedals. Due to its standard compact-pedal shape and size, the RC-2 fits perfectly alongside other BOSS pedals. Great for fast setup and convenient transportation. 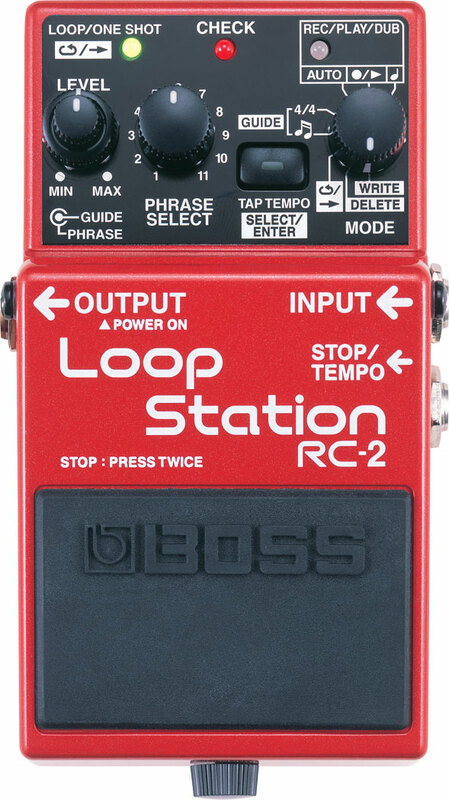 Thanks to the RC-2, there’s now a BOSS Loop Station for every size and budget. With the super-deluxe RC-50 at the top of the line, and the twin-size RC-20XL in the middle of the range, the RC-2 represents the most compact and affordable Loop Station. This is a cool little pedal for looping. You really need a remote switch plugged in to use it live. The remote switch plugs in on the right (STOP/TEMPO jack), and allows you to stop the loop, or when stopped, set the tap tempo. If you don't want to buy an external switch, or don't have the real estate for it, we can mount a stomp switch on the RC-2 which works the same way as the optional FS-5U footswitch. We use a RUGGED metal stomp switch, with soft-touch so you can easily press it without pushing down on the RC-2's normal on/off rocker switch. And you can still press the normal rocker switch by pressing on the right. We don't add the 2nd external switch, that one switches between saved banks.